In light of Mr. Dodd's epic articles "Gongfu Shave" and "Adventures in Shave Land" (I should also mention Hobbes' briefer comments, though I can't seem to find the right posts), I have delved into the world of "real" wet shaving. Having tired of the multi-bladed lift-and-ravage devices, I perused the newbie guides at Badger & Blade, and ordered myself a Merkur HD razor (the same as Steven's) some shaving cream, a brush, and various other odds and ends. Though it takes some time to learn, I am already enjoying it, and actually looking forward to shaving every morning! I much prefer a couple nicks to widespread irritation and ingrown hairs caused by multi-blade cartridge razors, and the smell of real shaving cream is far more luxurious than the canned stuff! Anyway, I just wanted to announce my new hobby. If you enjoy tea the same way Mr. Dodd, Hobbes, and Eastree do, you might take similar pleasure in executing a close, comfortable shave. As a newbie matcho I took your hint and picked up a pair of the black bowls at target: $7 for both. Now with one chawan too many, I suppose I will have to start shaving. 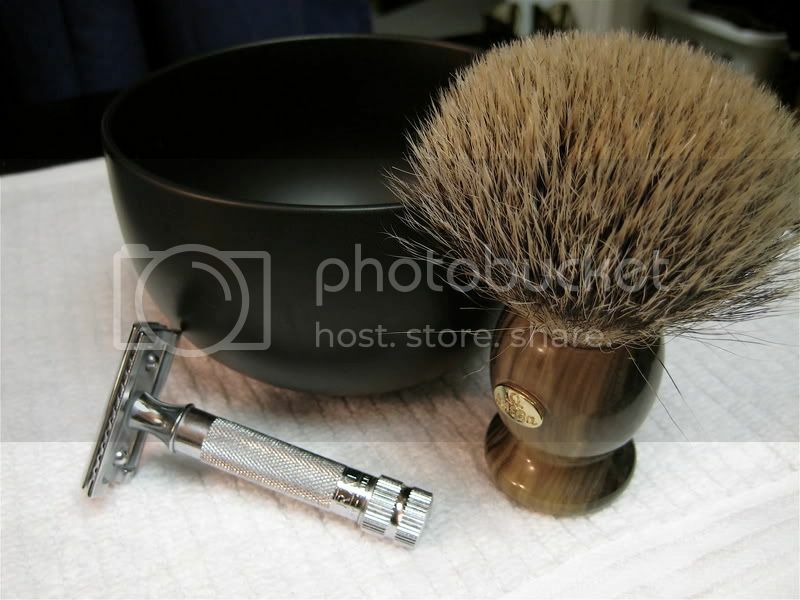 For shaving, you use the bowl to hold the shaving cream? I'm not sure I could handle using twin bowls for both, however. That could be am issue. P.s. Classic razor, good choice. Just make sure you don't confuse the two bowls, otherwise that could get ugly and unpleasant-tasting. But with regard to the bowl's use, you swirl the cream in there with a brush to generate lather. Not entirely different from whisking matcha actually, which is why the bowls work would well for either purpose. I'm working on it! I have some Taylor's Avocado right now, but I think I got an old or bad tub (just speculation) because it's almost as hard as soap. Taylor's avocado is my favorite so far. It's really creamy so what you have doesn't sound right. Tried stirring it up? I would try to stir it up, but it seems to be beyond saving in its current state. Should I add water to try and soften it, or should I just accept it for what it is? Yeah, try adding some water and mixing it up. Though if that doesn't work, I would suggest doing a replacement. That cream should have the same consistency as the others you have in the "Three T's" as Hobbes put it. They slightly differ in texture but it's very minute, possibly just a difference between batches and the weather.